An insightful collection of studies into the Viking, Neolithic and Bronze Ages of the Nordic world: exploring both the domestic and the regal in the rise to civilization. 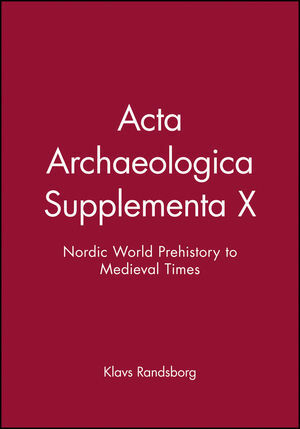 Klavs Randsborg is the Editor of Acta Archaeologica. Founded in 1930, the journal is the leading scientific international archaeological periodical in Scandinavia. It publishes full presentations of important new discoveries, archaeological analyses, and general and interdisciplinary studies with an archaeological basis. 1. Kings' Jelling (Klavs Randsborg). 2. Die Wohnstallhäuser Der Feddersen Wierde (Wolf Meyer-Christian). 3. Prominent Migration Period Building at Alby, Sweden (Jörn Hjulström, Sven Isaksson, Christina Karlsson). 4. Tæbring, Denmark, AD 600–1100 (Poul Mikkelsen, Annine S.A. Moltsen, Søren M. Sindbæk). 5. Magnate Estates along the Road: Viking Age Southwestern Scania (Anne Carlie). 6. Blót Houses in Viking Age Farmstead Cult Practices on Iceland (Bjarni F. Einarsson). 7. Between Two Worlds: The Meaning of Womens' Ornaments (Johan Callmer). 8. Skriduklaustur Monastery, Iceland (Steinunn Kristjánsdóttir). II. Neolithic & Bronze Ages in the North. 9. The Orientation of Danish Passage Graves (Claus Clausen, Ole Einicke, Per Kjærgaard). 10. Stability & Change in Scandinavian Rock-Art (Kalle Sognnes). 11. Permanent Lines (Klavs Randsborg). III. Links with the North. 12. The Great Mound Of Newgrange (Palle Eriksen). 13. Aistulf And The Adriatic Sea (Richard Hodges). 14. The Longphort in Viking Age Ireland (John Sheehan). 15. Detailed Bronze Age Chronology at 1850 (Klavs Randsborg).